Before/After Care: There is no before care, but there are other camps that run in the morning (see below). Taught by resident TDC faculty and expert guest artists from around the country, dancers will improve their strength, technique and flexibility. Styles include but are not limited to Ballet, Tap, Pointe, Modern, Lyrical, Contemporary, Musical Theatre, Hip Hop and Pilates. Students will be placed in technique-appropriate classes. Recommendation: If your dancer would like to attend Gatorland Day Camp in the morning from 9:00 a.m.-12:00 p.m., they are more than welcome. Your camper would attend Gatorland until approximately 11:45 a.m. and then we would have a camp counselor walk them from day camp to dance, where they would change and ready for the half day intensive to start at 12:00 p.m. It is a wonderful way to pair two of our incredible camps into a full day program. If you are interested in this option, please email Shannon Duckett, Director of Auxiliary Services at sduckett@spsfg.org, to arrange details, payment and coordination. Natasha Rhodes has been dancing for over 20 years and received a BA in Dance and Arts Administration from Elon University. She is an ABT® Certified Teacher Primary through Level 3. Additional credits include: Parsons Dance Company intern, Broadway Dance Center, Baltimore School for the Arts, Elmhurst Ballet School, UK, Baltimore Actors Theatre Conservatory, and The American Academy of Ballet. Natasha currently directs TDC’s Company, teaches Jazz and Ballet I-Ballet IV. Natasha also teaches Middle and Upper School dance at SPSG, directs Inertia, SPSG’s elite performance group, and is the choreographer for Upper School Musicals at The St. Paul’s Schools. Theme: "Dance through the Decades"
These intensives will immerse students in multiple styles of dance, including, but not limited to, Ballet, Musical Theatre, Tap, Jazz, Lyrical, and Tumbling. Students will also travel through time learning social dances from the 1950s, 60s, 70s, and 80s! Level III, taught by resident TDC faculty and expert guest artists from around the country, is designed for students to hone their technical skills from in Ballet, Pointe, Modern, Contemporary, Jazz, and Tap master classes. A dancer’s season is never over! 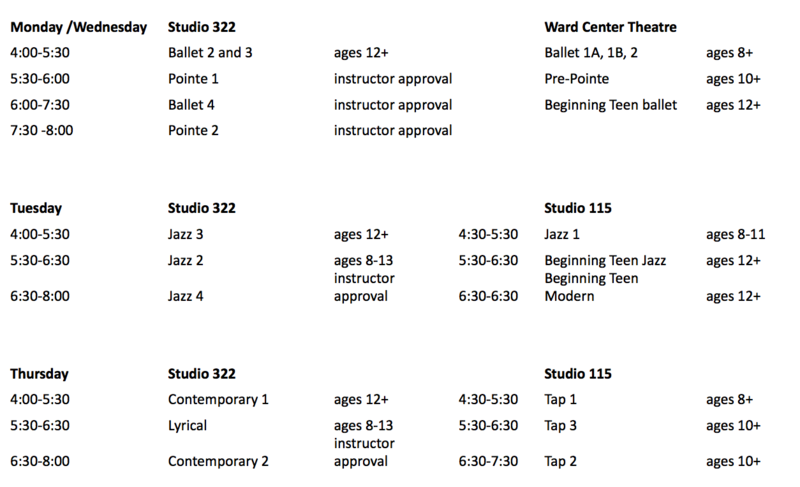 TDC summer classes offer a continuation of technique training in Ballet, Pointe, Jazz and Contemporary. Classes are taught by resident TDC Faculty and guest artists from around the country. Classes run Mondays/Wednesdays and/or Tuesday/Thursdays from Monday, June 17-Friday, August 9. For our advanced ballet 4 and pointe classes on Mondays and Wednesdays, please contact Mrs. Rhodes prior to signing up. She would like talk with you about your experience before you commit to the class. Our rates will be based on the number of class hours you would like to take. Example: If you are taking one hours per week, your TOTAL tuition for the eight weeks is $150 for the summer, not $150 per week. Plus, we will ask a $50 registration fee for evening classes enrollment. Tuition is non-refundable and cannot be prorated or transferred, except when a class is cancelled. Classes not meeting minimum enrollment may be combined with other evening classes and/or cancelled. We will notify you ahead of time if this is the case.